Gout is not the result of just one condition — there are several causes of the disease. Some are classified as primary while others arise as a result of other health problems, but all are characterized by joint pain. Gout is a condition caused by high levels of uric acid in the blood – and uric acid is the byproduct of the breakdown of purines and serves no useful function in the human body. A regular, healthy person is able to excrete uric acid through urine but for some people (like those with gout! ), this is not possible. There are two reasons why this is: there is too much uric acid in the bloodstream or the body is not able to excrete enough uric acid, hence the buildup. These two causes are interrelated with each other. Genetics and certain lifestyle choices cause uric acid levels to rise as well as inhibit the body’s ability to excrete uric acid. Once the correct condition is identified, an effective treatment plan may be developed. Until these techniques were perfected, many people were diagnosed incorrectly with gout. Careful examination of the synovial fluid offers healthcare providers with opportunities to rule out infectious diseases with joint pain that may resemble symptoms of gout. Health care providers are also able to determine whether or not the joint is inflamed or not, which provides further clues to the origin of the problem. Primary gout is due to an innate hereditary problem that results in the buildup of uric acid within the body. 90 percent of people who are diagnosed with primary gout are male; the condition is virtually nonexistent in premenopausal women. Secondary gout develops as a result of acquired metabolic problems or medication. Certain types of chemotherapy, such as those used to treat some leukemias, increase the likelihood of gout development. The most common type of gout — or crystal-induced arthritis — is the monosodium urate (MSU) type, which is characterized by uric acid crystals in the synovial fluid. Other kinds of gout arise due to the presence of various types of calcium crystals. Chronic gout, also known as gouty arthritis, affects several joints. Uric acid crystal deposits (tophi) build up in multiple areas of the body: synovial fluids, tissues, tendons, vertebrae, elbows, between cartilage and bones, in the cartilage itself, and in the skin. The course of chronic gout is highly variable; there may be chronic low-grade discomfort accompanied by mild flare-ups intermittently, or it may result from severe episodes, which create chronic deterioration of the involved tissues. Gout forms into sharp, needle-like crystals which can cause serious pain in the joints, with the big toe joint being the most affected. However, that is not the only sign of gout. Here are the top 10 gout symptoms and signs to watch out for. If you experience any combination of these symptoms, you may have gout. You might also like...How Much Water Do You Need to Drink to Prevent Gout Flare-Ups? Let’s start with the most obvious, toe pain or podagra as doctors call it. This is probably one of the most known symptoms of gout. It’s furthest from the heart making it the most prone for gout attacks. Flares usually happen in the middle of the night when the temperature is at its coldest. If you are lucky, your toe will be the only joint that gets affected when you have gout. What happens is that uric acid builds up in this particular area causing the sufferer to feel immense pain during a gout flare. At this point, it’s best to rest and elevate the affected joint to promote circulation. Recovering from a gout attack will take anywhere between one to two weeks. Aside from pain, you will also experience swelling and sensitivity. You will notice that the area around the joint or even the whole lower limb becomes very swollen. It becomes so sensitive that even the lightest touch or vibration caused by a person walking in a room can cause immense pain. You would have to take NSAIDs to make the pain subside. This symptom disappears in a span of hours or days. However, the toe can still feel sore in the next few days or weeks making it difficult to walk properly. For this, you can apply cold compress on the affected area. Just be very gentle though as your foot can be very sensitive to touch. Next page: Six more symptoms of gout – fever, tenderness, skin changes, peeling, elbow gout, and kidney stones. Gout can also occur in the whole body in the form of a mild fever. This is when you have chills and shivers which get more intense as the pain in the affected joint gets stronger. You may also feel muscle ache and fatigue. This combination of symptoms almost resembles the flu which is caused by the inflammation during a gout flare. However, it doesn’t last as long and will gradually subside after reaching maximum intensity. After the initial pain of a gout attack has subsided (first 12 to 24 hours), you may notice that the affected joint feels tender. Usually this tenderness climbs up slowly past the ankle and the leg. You may have difficulties walking in the next few days or weeks as your joints recover from the attack. When the affected joint is tender, your doctor may prescribe you to use a crutch otherwise, you will be limping –not the best way to go about your daily activities. It can be hard to function so be sure to get treatment right away. As the swollen area becomes larger, you may notice that the skin around the affected joint will turn reddish purple, and shiny. It almost looks as if you’re having an infection under the skin. Again, you can apply cold compress for this to help minimize the appearance of the symptom. Elevate the affected joint and try to avoid walking or standing for long periods as this can actually aggravate the pain. Also, don’t cross your legs as this can constrict blood circulation which can make the pain even more severe. Make sure to drink plenty of water to help dilute and flush out the uric acid. In certain cases, a gout flare can cause skin to peel and shed, almost as if you have a bad sunburn. When the skin swells from the inflammation, it stretches, turns red, and becomes flaky and itchy, sometimes even cracked. If bleeding starts to occur due to your skin cracking, call your doctor right away so they can prescribe you the right medication to prevent a fungal infection in the affected area. You may be given a hemorrhoid cream to reduce the inflammation or an over the counter antifungal cream like clotrimazole or terbinafine. 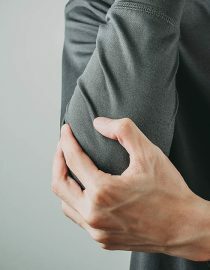 Gout attacks in your elbow are not as debilitating as those that you experience in your feet or hand, so you should still be able to resume your daily activities although you likely won’t be doing anything that involves swinging your arm. At this point, you have to tread very carefully as kidney stones make you more prone to experiencing gout attacks. Kidney health and gout are interrelated in a way that if one condition worsens, the same thing happens to the other. When your kidneys are not in good condition, you won’t be able to excrete uric acid as efficiently causing you to have more gout attacks. When your gout symptoms occur more often, you’re probably following a less-than-optimal lifestyle which in turn can also impact your kidneys. Drink lots of water regularly to help reduce the chances of stones forming in your kidneys. You also need to limit your dosage of certain gout medications like allopurinol as this can be very harsh to the kidneys too. This is where the saying “A healthy lifestyle is better than medicine” applies best. No amount of medication will help you if you don’t start the healing from within. Next page: Two more symptoms of gout – tophi and joint damage. More information on how often gout symptoms occur, getting diagnosed with gout and treating gout symptoms information. Tophi is one of the worst symptoms of gout. This occurs when you’ve had chronic gout for a long time and you’ve ignored all the medical advice given to you. At this point, the concentration of uric acid in the body is so high that deposits start to form in the joints. This can occur in the toe, ankle, knee, ear, fingers, and elbows. Basically, any joint in your body that’s far from the heart and blood circulation is poor. It seems painless in the beginning but once the deposit grows big enough, it can break out from the skin appearing to be chalky, white lumps. If left untreated, tophi can damage the joints and cartilage, as well as affect the organs. Tophi is usually treated with medication such as Krystexxa and febuxostat. These medications help shrink tophi and lower uric acid levels. The goal of the therapy is to reach uric acid blood levels of 6 mg/dl or below. If therapy doesn’t work, surgically removing the tophi is often required. At this point, the condition could already be greatly affecting normal movement hence the need for surgery. At the most advanced stage of gout, you may experience serious joint damage and bone loss. The affected joints feel permanently stiff, swollen, and painful, and the interval between attacks become shorter. Once you start experiencing these symptoms, it’s already called chronic tophaceous gout. This is why it’s important to treat the condition the moment you see early symptoms otherwise, you’ll experience lasting damage such as this. How Frequent Do Symptoms Occur? Depending on the type of gout you have, you may experience gout a few times each year. If you have acute gout, you will experience attacks one to two times per year. However, those who have chronic gout may experience multiple flares in shorter intervals. Most people will confuse gout with rheumatoid arthritis; it’s important that you learn how to distinguish between the two, so you can get appropriate treatment right away. Gout has a different pattern of joint involvement (ankles, midfoot, knees, and elbows) from rheumatoid arthritis. The pain is also much more dramatic with gout, unlike rheumatoid arthritis where the pain evolves more slowly and you’re still able to function normally. In fact, 44 percent of female gout sufferers who had children said that gout attacks were more painful than childbirth. Another tricky thing about gout is the age you start experiencing it. You may already have high levels of uric acid in the body when you are in your 20s, but you won’t know it until 20 to 30 years later. This is why most people who are affected by gout are middle-aged and older men. Dr. Robert Wortmann compares uric acid to matches. They can stay in your body quietly for years without causing inflammation and then one day, because of the very high concentrations of uric acid, the matches get lit and inflammation begins. There are also instances when a drastic drop in uric acid levels can cause a gout attack. This would explain why some men will experience a gout attack even if their uric acid levels are normal. Diagnosing Gout: Do I Have Gout? Or Is It Something Else? If you are still unsure if you have gout, it’s best to consult with your doctor. This is very important since gout requires lifelong treatment. There are several ways to get diagnosed for this condition. The most common and accurate is the joint fluid test where the doctor will draw fluid from the affected area and check for urate crystals under a microscope. You can also do a blood test, x-ray, ultrasound, or CT scan. Depending on your healthcare provider, doing a combination of these tests will help ensure that you get a proper diagnosis. The higher there are uric acids there are in the joints, the more subsequent the gout attacks will be. Thanks to modern science, there are now drugs you can take to help manage your gout symptoms. They can be classified into two types: medicine for treating gout attacks and medicine for preventing gout complications. Medicine for treating gout attacks can help relieve pain and control the inflammation. Severe joint pain and deformity may arise. Large tophi may cause dramatic changes in the appearance, particularly of the hands or feet. The disease can be so severe as to render the hands and feet virtually unusable. Tophi may cause breaks in the skin if they enlarge greatly, which can cause infection. Mobility, independence and body image may be altered. Living with chronic pain and debility can cause serious emotional distress. Elevated uric acid levels and crystal formation may result in kidney disease. Kidney stones and damage to the filtration system of the kidneys can occur. To avoid gout complications, certain drugs are taken to help manage uric acid levels in the body. There is medications like allopurinol and febuxostat which block the production of uric acid while there are medications that improve the excretion of uric acid. This includes uricosuric drugs like probenecid and lesinurad which help improve the kidney’s ability to remove uric acid. All these drugs are great. However, you shouldn’t be relying on medicine alone. Prevention through eating a gout-friendly diet (or avoiding foods that cause your gout to flare) and healthy lifestyle changes are always better than any pill. No matter how many medicines you take, if you are not taking care of your health, gout symptoms will continue to haunt you. Wouldn’t you want to address the root cause of the problem and enjoy the long-term benefits instead of using band-aid remedies that only treat the symptom? Now over to you. What symptoms have you experienced with gout? How did you manage it? Share your stories in the comments below.